Figure 1. Orion. © 2003 Torsten Bronger. Figure 2. 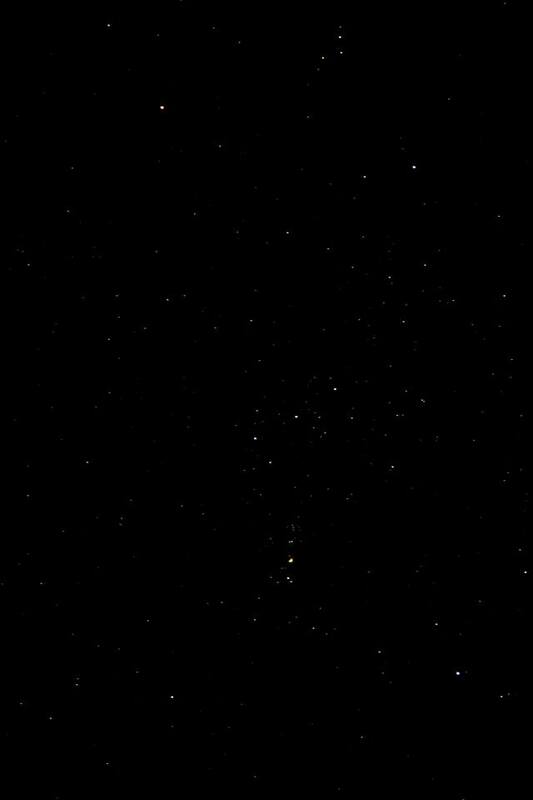 Photograph of Orion taken in Dundee, Scotland, on Jan 19, 2014. © David Cleave. Figure 3. The nebulae in and around Orion. Image credit: Jerry Lodriguss ©, Catching the Light. Figure 4. The Orionids radiant. Figure 5. Spiral arms of the Galaxy. Orion (abbreviation: Ori), the Hunter, is a spectacular northern constellation, located southeast of Taurus in the equatorial region of the sky (see Figures 1 and 2). 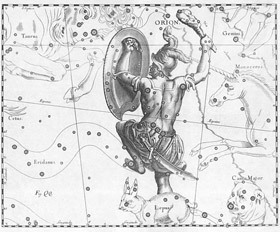 Drawing of Orion from Johannes Hevelius' celestial catalogue. Below Orion's Belt is one of the most famous deep-sky objects, the Orion Nebula. 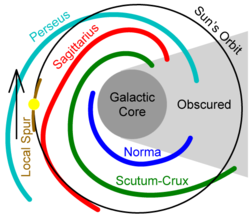 The orange-red supergiant Betelgeuse appears yellow in the upper center of Figure 3, while Rigel shines blue-white at bottom center. Midway between these two great luminaries of Orion are the three distinctive, bright stars that define Orion's Belt. Below and to the left of the Belt is a large stellar nursery containing M42, the Orion Nebula, surrounding the center star in Orion's Sword, which is seen overexposed in this image. Just above M42 is the nebulous complex containing the Horsehead Nebula, (B33) and the Flame Nebula (NGC 2024). 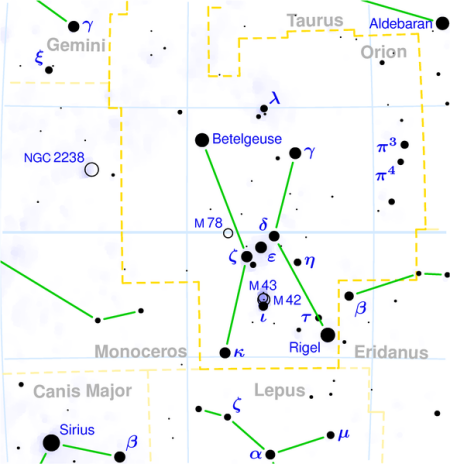 IC 434 is a long, thin, moderately bright nebulous region running north to south near Alnitak (Zeta Orionis), the eastern star of Orion's Belt. 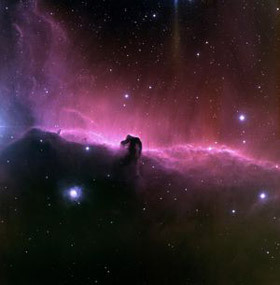 IC 434 is better known than its Index Catalogue number might suggest: it is the bright background nebula against which the famous Horsehead Nebula is silhouetted. Nearby are the Flame Nebula and the reflection nebula NGC 2023. 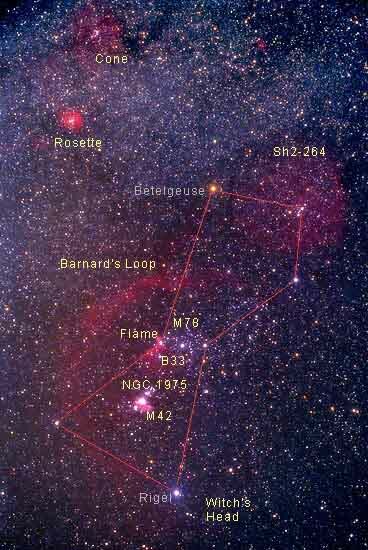 The largest emission nebula in the photo is Barnard's Loop, seen as a semicircle around the Orion's Belt and Sword. The next largest nebula is Sh2-264 surrounding Meissa (Lambda Orionis). M78 (NGC 2068), a small but bright 8 × 7 arc-minute reflection nebula is above the three bright stars of Orion's belt. A large but extremely faint reflection nebula, the Witch Head Nebula (IC 2118), lies just to the west of Rigel in the constellation Eridanus. The small bright red emission nebula at the upper left of the photo is the Rosette Nebula, and above it, the faint complex of nebulosity containing the Cone Nebula. Both these objects lie in the neighboring constellation Monoceros. The Orionids are the second annual meteor shower of the year that is caused by Earth passing through dust released by Halley's Comet, the first being the Eta Aquarids. As their name indicates, the Orionids have their radiant – the point from which they appear to radiate – in Orion (see Figure 4). The Orionids usually start on October 15 and end on October 29, and reach a peak during the morning hours of October 20–22. In the northern hemisphere, the maximum rate seen is typically around 20 meteors per hour, and in the southern hemisphere about double that rate. The maximum can last two or three nights. The Orion Arm is a minor spiral arm of the Milky Way Galaxy close to the inner edge of which the Sun is located (see Figure 5). Its name derives from the fact that the stars closest to the Sun which actually lie within the arm are in the constellation of Orion, about 2,000 light-years away. These include the bright stars of Orion's Belt, Alnilam, Alnitak, and Mintaka. The Orion Arm is also called the Orion Spur or Local Arm. It is important to recognize that the Orion Arm is not a physical structure but a zone where new stars have been created, by the passage of a density wave, and have subsequently illuminated the interstellar medium around them. The picturesque analogy has been drawn between spiral arms and bands of luminescent plankton churned up in the wake of a ship.